Children growing up in this world expect their toys to move. In fact, I'm starting to expect it too: reading an ordinary book (you know, on paper) I find myself wanting to touch the word to find out it's meaning. I know - it's totally wrong, but still, it's very practical that on a touch device I can do that. Conditioning is SO fast! Children today grow up with this duality: things that are possible on the screen, and things that are possible in 'real life'. But then gadgets are part of real life. These kids are, after all, the digital natives. This toy is a safe way for your child to learn about how circuits work, which is the basis after all of all our technology. For their first project they can build a burglar alarm or a doorbell, but more complicated projects are also included. Since this isn't a closed system, if your child likes it, you can get them upgrade kits for even more complicated projects. Who knows, they may start experimenting as well! Because the projects are arranged in order of complexity, kids can build on their skills as they progress through the manual. The lessons start out with a simple electric light and switch project that demonstrates how electricity is turned on and off with a switch. Further along, kids can put together a two-speed fan, create clap-controlled sounds, and more. Driving and Flying Fun for the Holiday Season! There is no doubt Remote Control Vehicles and Toys are great entertainment. Not only are RC cars popular toys for boys - even men like to play with rc cars, fish and air planes. There are lots of great Remote Controlled Vehicles for kids and adults as well as RC Toys and Animals available for Christmas. Featured on this page are the best selling Toys in the RC category. Kids, specially young boys will surely love the collection of Remote Control Vehicles and Toys: From Amphibian Vehicles to RC Tarantulas - there is lots of fun and exciting stuff to keep the Children occupied this Holiday Season! Best tablet for kids: android, iPad, kindle, Innotab or Leappad Explorer? There are two ways to pick a tablet for your children. One is to buy a (cheap) tablet that includes the option of parental controls. The other is to buy a tablet designed especially for children. If you do the first, you'll end up with a Kindle Fire: parental controls and full access to the Amazon store for books and apps. Of course you can control whether your kid buys anything. On the kids edition, amazon throws in a 2 year warranty that includes problems through simply letting the tablet fall. However tempting that may sound, reviews tell us it's not worth the price: get the ordinary kindle instead. If you want a tablet that is ONLY For your children and that although they might grow out of it, they can use without your getting involved, I advise the Leappad Explorer. It has a large library of games, books and music and is totally safe. The iPad also has parental controls: you can specify apps your child just can't use. They will have to find out your password to get access to internet, for instance, if that's what you set up. 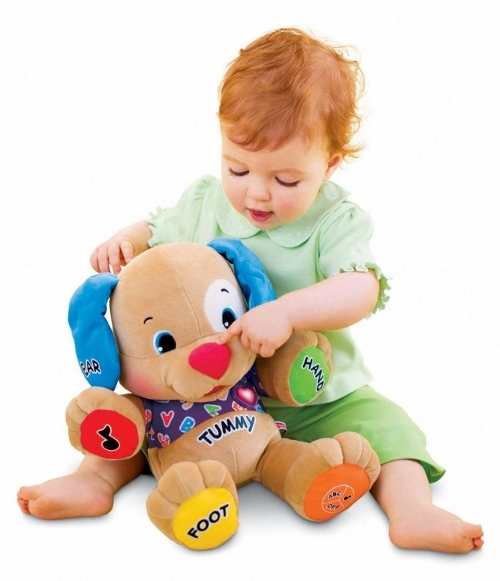 LeapFrog is a well known name in the field of Electronic Toys and Learning Systems. The LeapPad Explorer is a Tablet created for grade schoolers and tweens. This feature rich gadget is certainly a cool buy for Christmas. With numerous fun and learning activities Kids won't be bored with the LeapPad Explorer. A real cool two in one Electronic Toy. It functions as a Walker and also as a Learning and Activity Center. Introduce your child to shapes, colors, animals, and more basic stuff as she/he learns to walk. Recommended for children starting 9 months old babies to three year old toddlers. It is a sure treat to see a baby start walking. As a child starts to stand up and take small hesitant steps, there arises the need for support. Walkers have been a part of human cultures, around the world, for thousands of years. What if the Walker teaches your Baby too! Won't it be fantastic? The VTech Sit-to-Stand Learning Walker is an Electronic Toy, which is ideal as a first Christmas gift for your baby or toddler. Not only does it provide Kids support while walking - it is a Learning aid as well! With a barnyard of friends to cheer baby on, your little one will love learning to walk with the Sit-to-Stand Learning Walker. Start her out with the easy-to-remove play panel for floor play or fun on the run. Then step it up with the fun-to-maneuver walker. A medley of fun awaits -- the Sit-to-Stand Learning Walker keeps baby on track teaching shapes, colors, animals, music and more! Five Piano keys play music notes. Three shape sorters and light-up shape buttons teach kids basic shapes. Telephone handset, spinning gears and barn door which can be closed and opened enhance role play fun. The Electronic Walker is a cool Learning experience for Kids under three. Music, Shapes, Colors, Animals, and lots more. It introduces them to basic concepts, which will help them at school and in fact during their entire life time. Wouldn't it be great if you didn't have to worry about feeding and cleaning your Pet, havn't you wanted to turn mute your Dog or Cat when something important is at hand. With Furreal Friends Pets all this is possible! These cool and cuddly Pets are all ready to provide you hours of entertainment without being obtrusive! I met a 9 year old girl in the train the other day. She just loved her Fuzzy Frenzies. They're small cuddly animals on wheels that make noises as you touch their nose. The girl was so delighted with the noises she demonstrated them all to me, to the amusement of her mother who was of course sick of the sound by now. She had had her Furreal Friends (3 of them) for a year now and was still not sick of them. Official recommended age: 4 through 8. The Furry Frenzies are a cool new addition to the Furreal Friends collection. There are lots of cool Furry Frenzies to collect. The Kids will love to play with these Electronic Pets. Apart from the individual Pets, you can also purchase these cute friends in packs. Add a Playset and make the Game Play even more interesting and absorbing for the Kids! This beautiful Pony is over Three Feet tall and can handle kids upto Eighty Pounds in weight. It also moves the head, blinks, swishes tail, and responds when his young Master touches and speaks to it! A nice Christmas gift for all budding Equestrians. Who says learning isn't fun? Baby can learn A-B-Cs, 1-2-3's and parts of the body, plus sing along to ten favorite songs and games. Supplying a set of headphones for your toddler to use is a way to let them play but also a great way to provide some educational time, too. There are so many computer programs, games, and other activities that you can use the headphones for with your child. While they have them on, it is more difficult to be distracted by other activities or conversations that may be going on around them. Use Caution When Selecting Headphones for kids and even teens! As convenient as a pair of headphones can be for toddlers and kids, it is extremely important that you pick ones that are meant for kids. The volume levels on the ones for adults may be too high for a child's ears to be able to handle. You risk the potential of permanently damaging their ability to hear properly. Even some of the headphones that are for kids are not appropriate for a toddler so be sure to read the description for that. As I researched headphones for this list, I noticed some that I thought would be great for toddlers were recommended for children 8 and 9 years old. Many of the newer kid sets are designed with volume limiters in them which is safer for children, especially toddlers to use. Hot Digital Gifts for Kids, this Holiday Season! And most of them are educational as well! Christmas is just around the corner. It is time to shop for lots of stuff. Toys are among the most popular Christmas purchases. Electronic Toys have made a big impact during the past few years, and during Christmas they are selling like hot cakes. The choices on offer are varied and impressive. Tablets created specifically for children, Gaming Consoles and Reading Systems, Electronic Pets and Walkers, digital cameras and lots more. I have picked the Best Electronic Toys for Christmas and showcased them on this page. Hope this effort will help you choose the coolest Electronic gifts for your Kids this Holiday Season. Cool Forensic Toys and Spy Kits for Budding 007's! If your kid would like to follow the likes of James Bond and become a Technically Savvy Detective with spy gadgets and spy gear - there are lots of affordable Electronic Gadgets which can help him/her. These Detective Gadgets make great gift ideas for Christmas. They work really well and Children will have lots of fun while honing their investigative skills. While not as advanced as 007's OMEGA Seamaster - the Spy Gear Ultimate Spy Watch is good value for money at just a bit over $ 10. It includes cool features like World Time, Secret Communication Tools, Motion Alarm, and a Decoder Screen. Kids will surely love to sport this cool Spy Gizmo on their wrists this Christmas and beyond! Another best selling Spy Gadget. The Spy Video TRAKR is a cool Remote Control Vehicle which captures Video and Sound. The efficacy of this Spying Tool can be increased with the help of free online applications! I am a Cancerian, which makes the Moon my ruling Planet. Uncle Milton is a great Christmas gift idea for all those born under the Star Sign of Cancer, and Kids who like this fantastic Heavenly body. Moon in My Room helps Children learn more about the different phases of the Moon. Also cool as a Room Decor item! Who doesn't like Rainbows? Now you can create your own Rainbow with this fantastic Projector. It also includes a window prism disk to create Rainbows during Daytime! Are you looking for the best camera for kids? Choosing a camera for your child takes some consideration but on this page you will find tips for finding the ... See also toddler camera's and suitable camera's for tween use. I've found the ideal fake phone to make sure your baby or toddler leaves the 'parent's phone' alone. Seriously. It makes music. Your child can have a fake smart phone... See also ideas on how to give your child a fake iPhone and leave yours alone. As many of you know, I make a living as an online publisher. This involves writing about stuff that interests me, like the spiritual path and karma, spiritual book reviews and so on. However, to make ends meet, I also do product recommendations. I've started out of course with spiritual gifts, but there are also calendars, laptops, iPads, Harry Potter gear etc. It's all stuff I have bought or would buy if my house room and pockets were infinite. They're not and that's OK.
As you click through you'll notice that some of the gift pages are on this site, some are on other sites I've set up, and some are on squidoo - a free platform that donates 5% of all the income they generate to charity (and sometimes more). See also my new gifts blog.